Eisley (pointing out the icicle lights our neighbors recently hung up): "Look, mom! SPARKLING CARROTS!" Me: "You're going to wear your Elsa costume today?" Eisley: "Yes! I'm going to be Elsa-tastic." Eisley (trying her first Slurpee): "I want to have one of these all the days of my life!" Me: "Nothing's wrong. There are just funny things in my book." Me: "Oh, just jokes for grown-ups." Eisley: "Like…is there underwear in it?" Me: "Isn't the food at Disneyland always so delicious?" 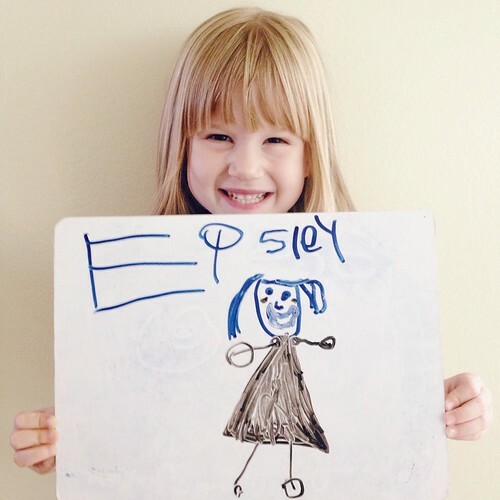 Eisley: "Do you know what Cora's new nickname is? Cantaloupe! Because her head is SO ROUND." Me: "So, how is the sandwich?" Eisley: "It's good. I made one of these before. With my daughter. You were in heaven, visiting Jesus." Eisley: "My name is Ramonica. I'm a ballet stepper." These are always so fantastic. These just made me giggle so much. Ramonica is the best. Also I love that Disneyland deliciousness is science, because obviously.